Investors have a lot to look forward to with the company's formidable growth strategy. The market hasn't been very fair to shareholders of specialty generic pharmaceutical manufacturer Akorn Inc. (NASDAQ:AKRX). Despite ridiculous growth in the company's top and bottom lines, the stock is down nearly 12% over the last three years. While a slight increase in share count has resulted in a 14% rise in the company's market cap during the same period, that's not quite an adequate reward for the tremendous operational performance. Consider that revenue grew from $317 million in 2013 to over $985 million in 2015, while EPS grew from $0.46 to $1.22 in the same period. Management is guiding for even higher watermarks in the current fiscal year, expecting total revenue of $1.1 billion and EPS of $1.65 in 2016. And yet the company can't seem to get any love from Mr. Market. However, I don't think investors will be left with the short end of the stick for much longer. Here are three reasons Akorn stock could rise. Akorn has achieved incredible growth in recent years. If it meets expectations for 2016, then revenue and EPS will have grown 254% and 258%, respectively, since 2013. But the company still has much more room to grow. The company develops, manufactures, and markets generic and branded pharmaceutical drugs. As with most other pharmaceutical companies, its amazing growth record has been fueled by its ability to bring more and more products to market. Unlike most other pharmaceutical companies, its fate is tied to a broad basket of products, rather than a few that might hit it big. In other words, the number of shots on goal is more important than the outcome of any single regulatory decision. Thanks to a number of acquisitions of drug candidates and manufacturing facilities in recent years, the company has plenty of shots on goal in the form of Abbreviated New Drug Applications, or ANDAs. At the end of the third quarter of 2016, Akorn had 83 pending ANDAs at the U.S. Food and Drug Administration and another 75 ANDAs in various stages of development. Those groups represented roughly $9 billion and $13 billion of annual revenue potential, respectively, according to IMS Health. That represents a remarkable amount of growth potential -- even if only a fraction of the products ever gain market approval. While it will make its impact gradually over time, management expects up to 12 product approvals in the first quarter of 2017. Whether you look at the trailing-12-month price-to-earnings ratio or the forward P/E (based on projections for the next 12 months' earnings), Akorn stock looks like a bargain. The company's current P/E is the lowest since late 2011. It could fall even further if the company meets EPS guidance for 2016 -- or the stock could rise to balance out the difference. AKRX PE Ratio (TTM) data by YCharts. There are noteworthy reasons for Mr. Market's pessimism. Management had originally stated that 25 ANDAs would be approved in the first quarter of 2017, but it recently reduced that to just a dozen (with others simply pushed to later in the year). Investors thought that was bad enough to sell off the stock on the day Akorn announced earnings. Coincidentally, that was the same day it was revealed that the Department of Justice is investigating generic-drug manufacturers for drug pricing collusion. However, worrying too much over delayed ANDAs is nearsighted, and even in a worst-case scenario, a DOJ probe wouldn't inflict too much harm on Akorn's diverse business. Sooner or later investors will have to recognize the bargain in front of them. One major knock against Akorn is its relatively high level of debt, most of which is related to two transactions in 2014 that were made to fuel growth (and they succeeded in that regard, by the way). It won't grab headlines, but the company has reduced its debt from $1.05 billion at the end of 2015 to $808 million at the end of the third quarter of 2016. That represents a drop of nearly 23% in just nine months. Akorn still has a long way to go: Its SEC filings show that it had long-term loans of $354.3 million and $477.7 million outstanding at the end of the third quarter of 2016. The payments made earlier this year fulfill the company's quarterly repayment obligations until the loans come due in April 2021, which creates several options. Akorn can make additional payments at any time or forgo debt payments to rebuild its cash position from its healthy operating cash flow, or issue stock to pay down the debt, or any combination of those options. The good news is that as the business grows and cash flow continues to improve, Akorn's ability to reduce debt will improve, clearing that cloud hanging over the stock. 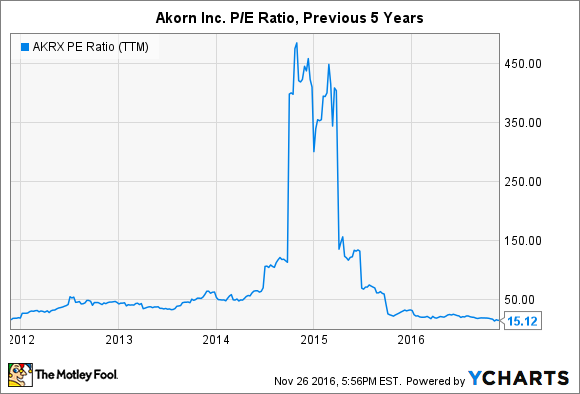 Akorn investors have not been rewarded for their patience in the last three years. However, a number of tailwinds should push the stock to a tipping point in the near future. The growth and value are undeniable, while an improving balance sheet provides ample financial flexibility. I think the evidence is clear: Akorn's stock should rise from current levels.